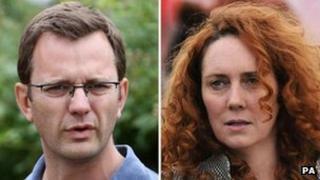 Ex-Downing Street communications chief Andy Coulson and ex-News International chief executive Rebekah Brooks have been charged over alleged payments to police and public officials. Journalists Clive Goodman and John Kay and MoD employee Bettina Jordan-Barber also face charges, the CPS says. Mr Coulson, who was editor of the News of the World before moving to Downing Street, says he denies the allegations. Operation Elveden is the Met Police investigation into corrupt payments. Mr Coulson has been charged with two conspiracies relating to the request and authorisation of alleged payments to public officials in exchange for information - including a royal phone directory known as the "Green Book". It is said to have contained contact details for the Royal Family and members of the household. Mr Goodman, a former royal correspondent at the now-defunct News of the World, is to face the same charges, the CPS says. These two counts of conspiracy to commit misconduct in a public office involve one between 31 August 2002 and 31 January 2003 and another between 31 January and 3 June 2005. Mr Coulson was charged when he answered bail at Lewisham police station and was bailed to appear at Westminster Magistrates' Court on 29 November. In a statement, Mr Coulson said he was "extremely disappointed" by the CPS's decision. "I deny the allegations made against me and will fight the charges in court," he said. Mrs Brooks and former Sun chief reporter John Kay have been charged with conspiring to pay Ministry of Defence employee Bettina Jordan-Barber around £100,000 for information. The three face one count of conspiracy to commit misconduct in a public office between 1 January 2004 and 31 January 2012. The MoD said it would not comment on the charges related to its employee, who has not yet been formally charged. The Metropolitan Police said Mr Kay, 69, and Mrs Brooks, 44, were both charged as they answered bail on Tuesday. They will appear at Westminster Magistrates' Court on 29 November. Alison Levitt, principal legal adviser to the Director of Public Prosecutions (DPP), said: "All of these matters were considered carefully in accordance with the DPP's guidelines on the public interest in cases affecting the media. "This guidance asks prosecutors to consider whether the public interest served by the conduct in question outweighs the overall criminality before bringing criminal proceedings." So far 52 people have been arrested as part of Operation Elveden. Two of them, a retired police officer and a former journalist, have been informed that they will face no further action. Operation Elveden is being run alongside two other inquiries - Operation Weeting, which is looking at allegations of phone hacking, and Operation Tuleta, an inquiry into accusations of computer hacking and other privacy breaches. The investigations into possible media and police misconduct followed allegations of phone hacking at the News of the World, which led to the closure of the paper after 168 years. * On Wednesday, a day after the other two suspects were charged, Ms Jordan-Barber, 39, from Shrivenham, Swindon, answered bail at a west London police station and was also charged with conspiring to commit misconduct in public office. She will also appear at Westminster Magistrates' Court on 29 November.